A developer has unveiled plans to convert a historic hospital site in Aberdeen into a 52-room boutique hotel and residential complex. CAF Properties is to seek full planning permission to renovate four buildings at Woolmanhill Hospital, which is undergoing a phased closure. Built in about 1750, it was part of the original Aberdeen Royal Infirmary. The plans include 27 serviced apartments, 32 residential apartments and 10 affordable flats. A central square would also be created. 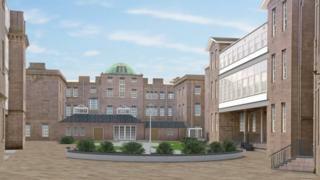 CAF Properties said a planning application would be made jointly with NHS Grampian as the current owners of the site. The hotel and serviced apartments would be owned and run by Glasgow-based leisure operator G1 Group. Subject to planning consent, CAF expects redevelopment work to start on the site in the middle of next year, with completion scheduled for 2019.